The good news from this year’s Martin Luther King, Jr. weekend is people are starting to dig deeper into King’s own words (ahead and before “I Have a Dream), his philosphy, maybe even his regrets that we’re now living up to. What blueprint did he leave for the movement especially on the economic front? Was the “revolution of values” part of it. If you’re a Depression era kid or were influenced by a Depression era kid, you get that “values” thing. But it’s a hard sell to kids today. According to the American Psychological Task Force on Advertising, $12 billion dollars a year is spent to reach the youth market with over 40,000 commercials directed at children. For the Depression era kids, advertising to the young ones was off limits. Better yet, you had a better idea of the difference between need and want. But in the digital era where wants now connect you with your needs, the lines are definitely blurred. What does a “revolution of values” mean today? Somehow the moral imperative of this scenario has been twisted. It’s not the “haves” who are expected to adopt King’s “revolution of values,” not the wolves of Wall Street. The onus is on the “have nots” who waste much, go over and under in debt, tap out unemployment, and sink in foreclosures. Somehow, it’s the poor person’s fault and the poor person’s solution – totally. Your schools are failing. Your grocery stores are closing. You are unqualified for the jobs of today. You don’t live near services like a hospital or health center that can only be reached by car. You don’t own a car. You spend over 50% of your salary in rent. It’s enough to make you want to…..
Gates asked the question: Was not addressing economics the failure of the civil rights movement? 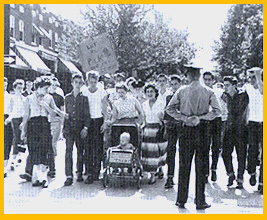 Or were the breaks put on any movement from civil rights to economic justice? In the words of the Rev. Dr. Martin Luther King Jr.
A true revolution of values will soon cause us to question the fairness and justice of many of our past and present policies. … A true revolution of values will soon look uneasily on the glaring contrast of poverty and wealth. With righteous indignation, it will look across the seas and see individual capitalists of the West investing huge sums of money in Asia, Africa, and South America, only to take the profits out with no concern for the social betterment of the countries, and say, ‘This is not just.’ It will look at our alliance with the landed gentry of South America and say, ‘This is not just.’ The Western arrogance of feeling that it has everything to teach others and nothing to learn from them is not just. Violence and poverty go hand-in-hand. Poor streets. Poor schools. Poor employment. Poor healthcare. Poor life habits. Poor mom. Poor dad. Poor sis. Poor brother. A Poor grade. The fact remains no one wants to be poor. Sadly today the middle ground has shrunk. Middle class means looking down from the top of a sliding board, not a ladder. The great abolitionist, orator, journalist, and activist Frederick Douglass’ home was and continues to be the beacon on Cedar Hill in the Civil War enclave of shotgun houses built by freedmen known as Uniontown. And the Panorama Room at the Our Lady of Perpetual Help Catholic church has the greatest view of the nation’s capital than any high point in the city. It’s also situated where you have some of the cleanest air in the city. Regardless of race, all residents of Anacostia were united in their belief that the municipal government wasn’t providing enough in the way of public services to the area. The all-white Anacostia Citizens Association and the black citizens represented by the Barry’s Farm/Hillsdale Civic Association complained repeatedly of poor service to their side of the river. And it didn’t get any better. Public transportation continued to be spotty. The local public school I attended spent more time dealing with behavioral issues than teaching. I had to learn on my own about solar energy for a science fair project. It was a poor attempt for me having no intellectual or material resources available except for Mother Earth News. Don’t blame the parents. They weren’t scientists or had scientist or engineering friends. I saw the beginnings of the fast decline when a McDonald’s couldn’t survive in the neighborhood. But we stayed until my college education was completed and paid for (minus the loans). Then we moved on and out. That may have been my exit strategy. I don’t have regrets about leaving, neither do I have bitterness about what I left behind. 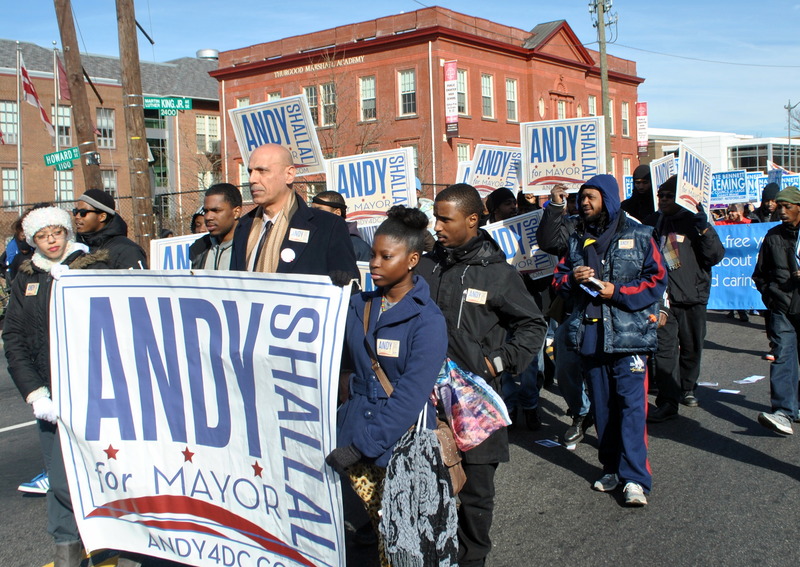 There’s a special spirit in Anacostia and Ward 8 that is missing in other parts of the city where economic instability and inequity are present. And not everyone in the ward is poor. Not every home is unstable. When I visit the old neighborhood today, I don’t feel despondency. People are moving about. They always have. In fact, I remember seeing Park Police on horses coming down MLK, Jr. Avenue. And yes, with the coming of the Homeland Security to the historic Saint Elizabeth’s Hospital Campus, and cultural art centers to the “last urban frontier,” the uneasiness among the long-term residents comes with a spirit of determination not defeat. And often frustration and unspeakable fear. Before King’s assassination, the movement was turning to address the “poverty problem” in the country with a Poor Peoples’ march on Washington. Without its leader and a horrible downpour that soaked the tent city, the march failed to take the movement to that next level. By 2018, it is estimated that 80 percent of the jobs in the District will require better than a high school diploma. Yet some 64,000 adults in our city lack a high school credential and more than a third of the city’s adult residents are functionally illiterate. And in Wards 7 and 8, the illiteracy rate jumps to nearly 50 percent. When a candidate marches for peace in a community with a reputation for poverty and violence, one can only take that as a sign that the problem has to be addressed from more than just real estate potential and value, but seeing potential and value in people. “Idle hands are the devil’s workshop,” my grandmother would say. 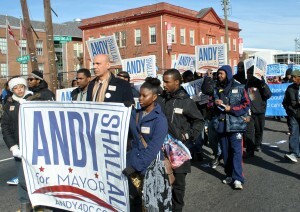 I believe Andy Shallal is catching some of the same spirit wind I get when I visit MLK, Jr. Avenue, SE today. And like Andy, I don’t feel comfortable with high illiteracy rates, outrageous housing prices, limited job and economic opportunities for low income, youth, and middle income people to rise to the next level. These are the elements that contribute to poverty of spirit that turns on one’s self and each other. I don’t want to go back to the days of Frederick Douglass, the sock hops of segregated Anacostia, or the neighborhood of my past. This has to move forward with a new and inclusive vision. I don’t want a city of gold. A Gilded city is soulless and boring. What was the hope and vision of the people who wanted to name these city streets after Martin Luther King, Jr.? Was it a symbolic band-aid for the communities with No jobs. No justice. No peace. The balm for the dream deferred? Or will these be the streets where dreams can come true? With all the politico babble about the upcoming DNC convention, VP suspense, what the Clintons will (or will not) do for the Obama campaign, I’ve created my fantasy scenario. What say we get all those delegates, politicos, and the like up on the convention floor for some line dancing. Can you imagine? Thousands of people in perfect unison. Who goes in the middle? Step to the left, to the left, to the left. Step to the right, to the right, to the right. Now kick, kick, kick. Line dancing just feels right when you’re all in step. It feels good! This summer I realized how out of touch I’ve been when I went to a block party in the Shaw neighborhood of Washington, DC. I was invited by Brian Williams, founder of the dance group Step Afrika!, a professional dance company dedicated to stepping. Stepping is a dance tradition created by African American college students. Step Afrika! has travelled internationally as US cultural ambassadors. More on Step Afrika! in a future entry. Now this block party was just folks having a good time. It didn’t matter who you were, what your busines was, or your connections, at the block party everybody’s grilling and hanging back. At least three tables were set up for the fellas to get into their card and domino games. At the end of the block, was the inflated bouncer for the kids. Grills were flipping hamburgers, hot dogs and ribs. The newcomers on the block made pasta salad and ribs. All cars were moved off the street so the block was wide open for riding bikes, skating, and line dancing. We have tons of them..they are called, in black Greek culture, PARTY WALKS, HOPS OR STROLLS. For me, the block party was a happy reminder of how party unity is possible with a few steps, kicks and a slide. Can you put that on the platform? I found this video on YouTube courtesy of Step in the Name of Life, based in Miami, FL. Their goal on their website is to fight High Cholesterol, High Blood Pressure, Diabetes, & more within our on communities. Now that’s incentive.